Scientists at The European Organization for Nuclear Research (CERN), announced Friday morning that they had accelerated beams of protons at the world’s largest particle accelerator, the Large Hadron Collider near Geneva, to energies of 3.5 trillion electron volts. That is a new record, three times the energy of any other machine on earth, and means that the collider, after 15 years and $10 billion, is on the verge of beginning to do physics experiments, according to a report in The New York Times. "We're all hoping [the collision] will happen in the next couple of weeks," said James Gillies, a spokesperson for the European Organization for Nuclear Research (CERN), which operates the machine. "If things continue carrying on the way they've been, that's a pretty safe estimate," National Geographic reported. 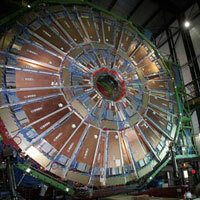 The Large Hadron Collider, which had been under construction since the late 1980s, shot its first beam of protons around a 17-mile, vacuum-sealed loop in September of 2008, but then quickly ran into trouble, Computerworld reports.